This article will explain all aspects of the administrator mode in the Import from Google Drive tool. The administrator mode is a migration mode offered in the Import from Google Drive tool. 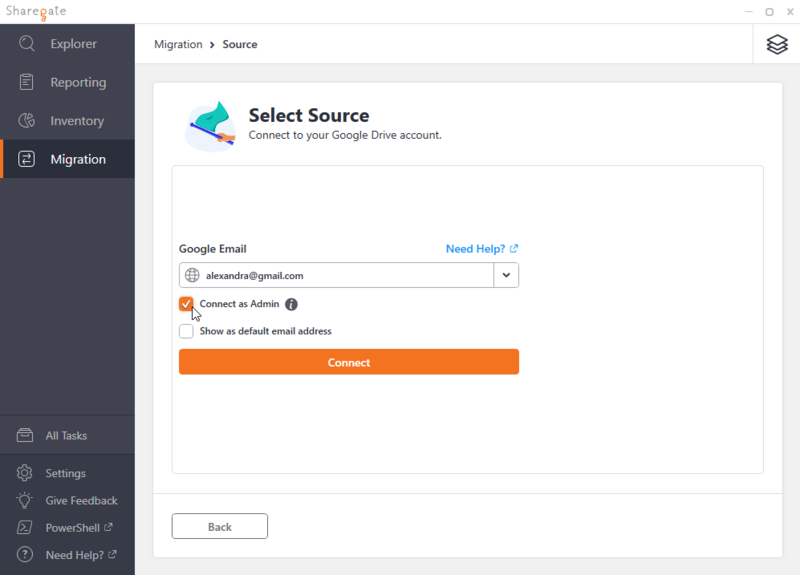 This mode is useful when you want to migrate multiple users in your domain without connecting to each one of those accounts manually, because it lets you see and migrate all of your user's files in your domain. To use this mode, simply check the option offered to you in the connection screen. View users on your domain (read-only): We need to list all of your domain's users to list them in the explorer and so you can create user mappings. View groups on your domain (read-only): We need to list your groups so you can create group mappings. View domains related to your customers (read-only): We need to know what domains are associated with your Google Apps account to check if you are allowed to create credentials for users that have a different domain in their email address. Once you are logged in as an administrator, you will see that the explorer differs from the normal Google Drive explorer. The root folder will be the domain from which you logged in. This may or may not be your primary domain associated with your Google Apps account. You will see a list of your users in the explorer, making it easy for you to select which user's content to migrate. You will see information about the user that is currently selected. This information may be useful for you in deciding what to migrate. You can dig down into the user's content by double-clicking on the user in the explorer. Please note that you must be a Super Admin in your Google Apps domain in order to use the administrator mode. If you are not, you will see the following error message. In the next section, we will explain how to make the administrator mode work on your Google Apps account. Since this mode allows ShareGate Desktop to impersonate your users, it requires a couple of steps in order for it to work. Make sure you have the Super Admin permission in your Google Apps admin console. You may have to ask another Super Admin for that permission if you don't have it and absolutely want to do the migration using your account. Here is an article from Google documenting the process of adding admin roles to a user. You then need to delegate domain-wide authority to ShareGate Desktop's service account. In order to do this, you can follow this step-by-step procedure provided by Google. You need to enter the following information in the "Manage API client access" page. Your "Manage API client access" page should look like after you add ShareGate Desktop's service account. At any time you may remove ShareGate Desktop's access to your data by clicking Remove (shown next to #3 in the screenshot above). By doing this, we won't be able to access any of your data almost immediately, which will stop your migration.